“Their wagons must have passed along here as they went from Miami Mission to Paola, you can still see the depressions of the wheel ruts.” Lloyd Peckman’s voice sounded out clearly over the leaves crunching underneath our feet as we stood in the wooded Kansas bottomland owned by Vernon Prothe. So much of our ancestors’ experiences in Kansas have been erased from the land. Despite the dedicated work of community member Clarence “Gene” Hayward, much of the Myaamia experience in Waapankiaakamionki (our lands in Kansas) remains lost. But then, there are moments like this, where local farmers show you places where our people’s time in Kansas still shows on the land in the traces of their wagon wheels; places where our graves still sit, marked for all to see; and even homes where Myaamia people still live, on or near the lands that their ancestors took up after our first forced removal in 1846. 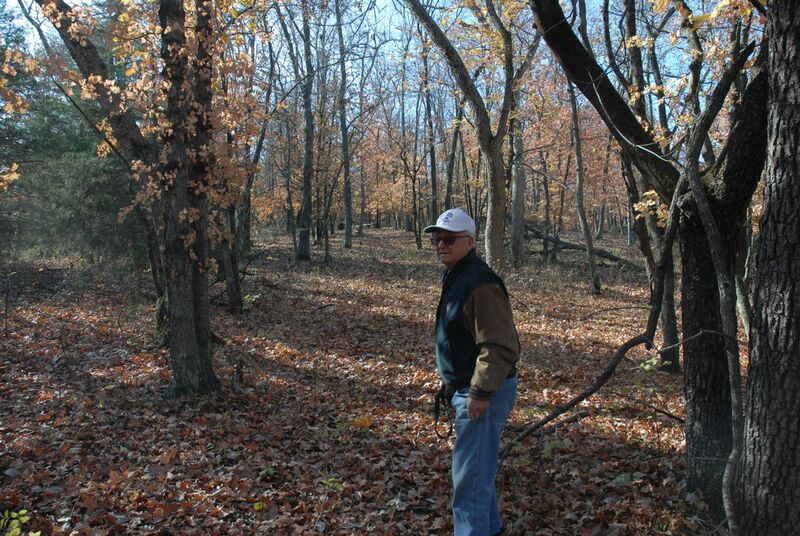 Mr. Lloyd Peckman showing us the wagon road running through the trees from Miamitown to Paola, Kansas. The depressions run into the distance in the center of the photo and then begin to turn to the left and move out of the frame. Places can tell you stories if you sit and watch and listen. But the stories come a lot quicker if you are lucky enough to have some folks share their own stories of the land with you. In early November of 2012, Gene Hayward, Helen (Gene’s wife), noohsa (my father) George Strack, and I visited with farmers, whose families have lived in Miami County, in eastern Kansas, since the early 1870s. Most readers will probably remember Gene from his Kansas history table set up at the 2012 annual meeting or his book “The Lost Years: the Miami Indians in Kansas.” Gene put us in contact with Lloyd Peckman, who organized a two-day tour of the old Miami Reserve with the farmers who work the land in Waapankiaakamionki (The Swan Water Place – our name for that part of Kansas). Mr. Peckman is an extremely helpful and knowledgeable local farmer who lives south of Paola, Kansas. His family has lived in eastern Kansas since the late 1800s. As a result of this long tenancy, he knows most of the other farming families in and around the Paola area. From left to right: Clarence “Gene” Hayward, George Ironstrack, and Lloyd Peckman at Jingo Cemetery, which sits just west of the first Myaamia Sugar Creek village. On the first day of our visit, noohsa and I were met at the Paola Inn by Gene and Helen Hayward and Lloyd Peckman. Mr. Peckman drove us out south of town to the site of the historic Myaamia village called Miamitown, although the names Miami Mission, Miami Village, and Miami Bottoms also show up in the historical record. Miamitown was the second communal village established by Myaamia people after the 1846 removal. The first village at Sugar Creek had become unhealthy due to its close proximity to the Missouri border and the grog shops that proliferated the other side of the border. The Sugar Creek location may have also become unhealthy because of illnesses that accompanied the contamination of the water supply. Additionally, the community may have moved in order to be closer to a mission school for their children. Miamitown was the communal village of Myaamia people prior to the allotment of our lands in Kansas, but it was also a popular place to live and visit for non-Myaamia immigrants. 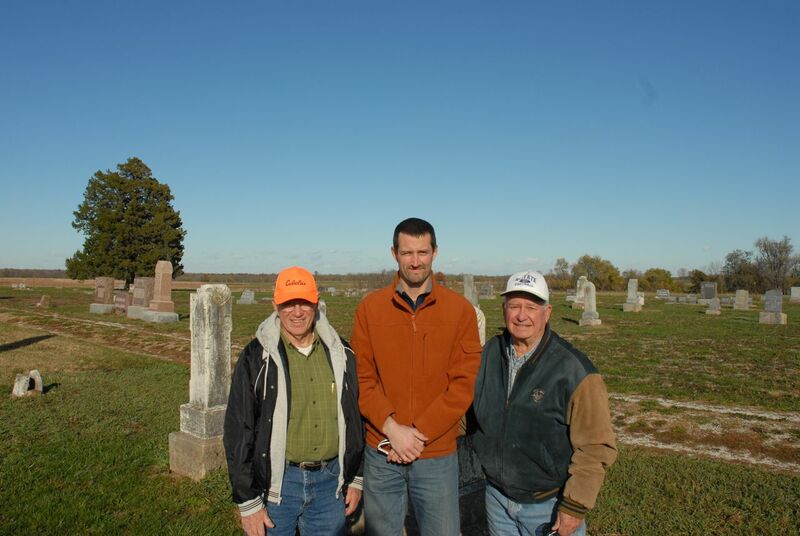 Today, the site is located on or near the farms of John Grother, Steve Grother, and Raymond Rodelwald. 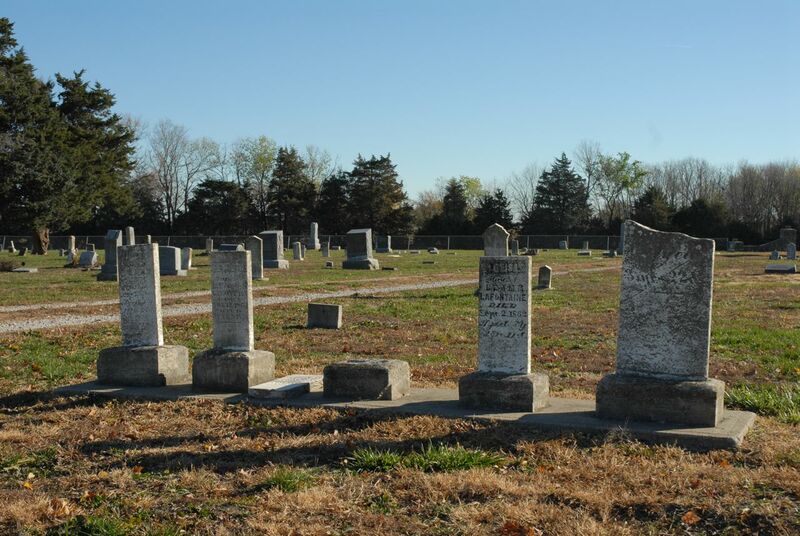 John Grother lives just to the east of the historic village, and at the back of Mr. Grother’s land, on his son Steve’s property, lies a lightly wooded bottomland where the cemetery for the Miami village sat. A generation or two of Myaamia people and non-Myaamia people were buried in this cemetery. Mr. Grother located two headstones from this cemetery that were still relatively intact, one of which belongs to Mary Geboe and her son Brutus. 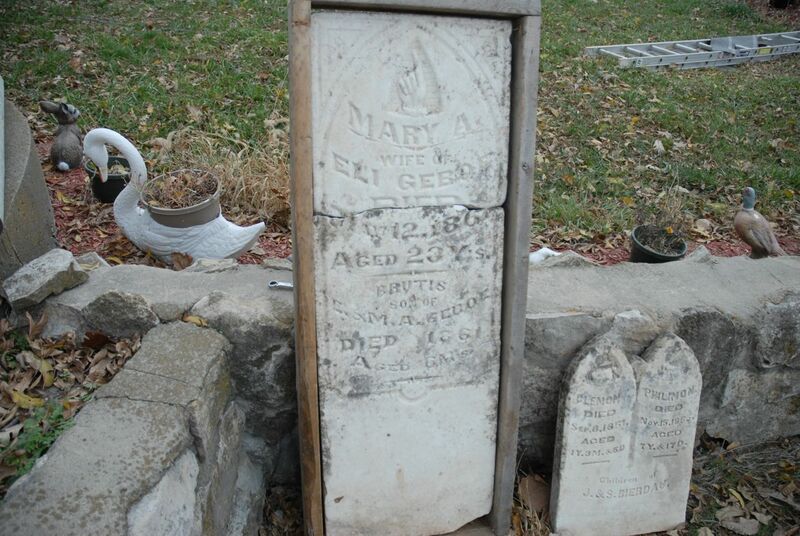 Mary was the wife of Eli Geboe, who may have eventually moved to Indian Territory (Oklahoma) in the second forced removal. Mr. Grother has gone to great lengths to protect and preserve the headstones that he has found and we all owe him “mihši-neewe” (big thanks) for helping to preserve and protect a significant piece of our history. The cemetery is no longer marked by signs or stones, but it does contain a number of šiinkwaakwa (Eastern Red Cedar), a medicine tree commonly used to mark Myaamia cemeteries. Headstones from the Miamitown cemetery. On the left is the stone for Mary A. Geboe (the wife of Eli Geboe) and her son Brutus. The stone on the right is believed to be from one of the early non-Myaamia settler families, but as of publication this has not been confirmed. After visiting the cemetery, we were joined by Raymond Rodelwald, who farms the land where most of the Miamitown village sat. Mr. Rodelwald graciously let us stomp around in his field and the bottomlands to the west of the village site. The Miamitown site is quite large, stretching from north to south over at least a third of mile. In 1857, a recent immigrant to Kansas, H.M. McLachlin, described the village as a place “of importance.” In his memoir, McLachlin describes his first trip to the village. He rode into Miamitown on David Geboe’s wagon. He also noted the fine double log boarding house run by a “Mrs. Richardville,” this is likely where McLachlin stayed on his first visit to Miamitown. It was at this boarding house that McLachlin enjoyed regular dances set to violin music provided by Wells Mobley and Tom Lafontaine. McLachlin stated that Lafontaine was one of the “sweetest violinists I ever heard.” He also mentions the names of his neighbors, who included a Lafalier. Richardville, Mobley, Lafontaine, and Lafalier are not explicitly listed as Myaamia, but it seems likely that all four were connected to the families who participated in the 1846 removal, or who came west in the years that followed. McLachlin’s stories demonstrate that over a decade after forced removal, Myaamia people had rebuilt a sizeable village community at Miamitown. However, by the time of McLachlin’s visit, Anglo-American settlers were already overwhelming the community. After the village site, Mr. Peckman took the group to the Miami County Historical Museum in the town of Paola. The friendly staff welcomed us and allowed the group to nose around in their collections. 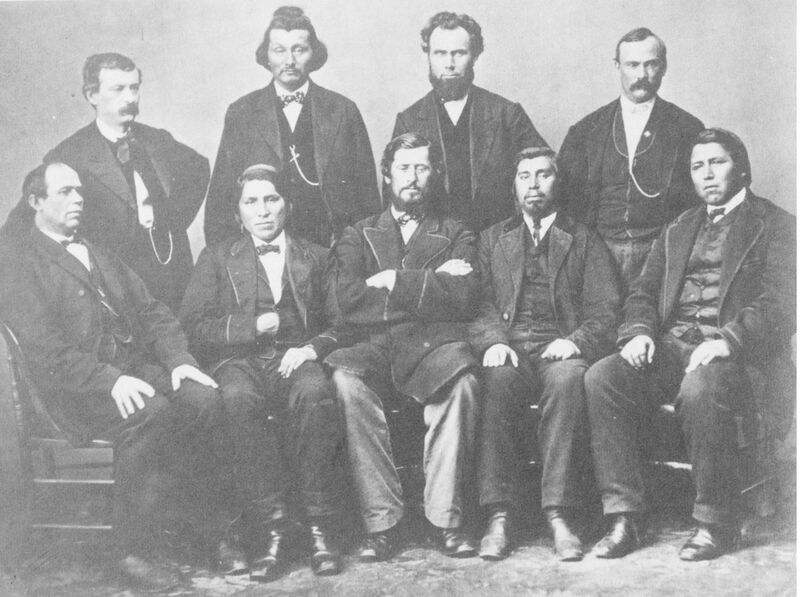 One important find that Mr. Peckman shared with us was a copy of the “Delegation Photo” that came directly from the family of one of the agents in the photo. On the back of this photo, the family identified the three government officials who were photographed with the Myaamia leaders. This is the first solid identification that we have for the government employees (see the photo below). The “Western Chiefs Delegation” photo from left to right standing: Charles Schooler Beeson (clerk at the agency), Thomas F. Richardville, G. Adolphus Colton (Indian Agent), and Captain Sims* (local U.S. Army officer). Sitting from left to right: David Geboe, Peter Lafalia, John B. Roubideaux, Thomas Miller, and Louis Lafontaine*. Those names marked with * still need additional confirmation before we can say with 100% certainty that the identification is correct. After a brief rest, Mr. Peckman took the group to meet Jack York who has a substantial collection of metal objects that he’s found over 30 years of metal detecting in and around Miami and Linn counties. Mr. York shared with us a wide variety of metal tools and implements found around the two Myaamia villages, Sugar Creek and Miami Mission, and on Myaamia allotment sites. Some of these items were produced in the 1700s. If these items are related to Myaamia people, then they are possibly family heirlooms that our ancestors carried with them on the forced removal in 1846. On the second day, Mr. Peckman took us to visit with Vernon and Donna Prothe. The Prothe’s own and work the land to the north of the Miamitown site, specifically the parcel where one can still see that wagon ruts that ran from the village to the town of Paola. Donna Prothe might also be a descendent of the Demo family. She’s still working on her family’s genealogy, but it seems quite possible that her family could be Myaamia as quite a few of our people stayed in Kansas during the second forced removal of the 1870s. Mr. Prothe took the group out for a ride in his “mule,” an old Ford F150 4×4, down into the bottomland to the north of the Miamitown site. On this route we had the pleasure of seeing old wagon roads and horse trails as well as many beautiful views of the Waapankiaakami (Marais de Cygne River). We spent the afternoon of the second day under the guidance of Gene Hayward. Gene took the group to the Miami State Fishing Lake, a place that was called Pigeon Lake in the mid to late 1800s. To the north of this lake sits a high ridge, originally called Pigeon Ridge. Gene shared with the group that this is the place where Myaamia people used to gather after annuity payments in order to dance and celebrate together as a community. The ridge and lake were originally named for the flocks of millions of passenger pigeons that used to travel through the region and nest on the ridgeline as they passed through. What a site both those gatherings must have been. From Pigeon Lake, Gene took us to the Sugar Creek village site. This was the site of the first village Myaamia people built after arriving in Marais de Cygnes River Valley. They stayed at this site until the spring of 1848. Gene recounts the story of this village in his book “The Lost Years: Miami Indians in Kansas.” The high ground of the Sugar Creek village sits comfortable above the high water of La Cygne Lake, a relatively new lake created by the La Cygne dam. Sadly, we were not able to hike into this site as deer hunters were spread out throughout the hills and we weren’t wearing enough bright orange. This site is where Myaamia people went about beginning the process of rebuilding their lives following the first forced removal. Myaamia people lived here for less than two years, but despite this short tenure, it remains an important place that we plan on deepening our knowledge of in the near future. That evening, we said “neeyolaani-kati” (see you later) to Gene and Helen and we promised Mr. Peckman that we would see him for dinner the next day. He had to return to his farm in order to catch up on all the work he had missed while serving as our tour guide for two days. We can’t say enough how much we appreciated his help. The next day, noohsa (my father) and I headed south to Fontana, Kansas. Around 1860, the railroad line was extended south and the town of Fontana was born as a result. The economics of railroad expansion may have drawn many Myaamia people to the town. Local oral histories claim that Miamitown disappeared after the railroad came to Fontana. Quite a few Myaamia allotments were also around Fontana, and in the Fontana Cemetery, noohsa and I located the graves of George and Frank Washington as well as Lewis and Louisa Lafontaine. We also found markers for numerous McCoys and Palmers, but we were not sure if these were the Myaamia branches of these families, or their extended Anglo-American kin. Hopefully, in the near future, we will return to Fontana with more information and find the locations of Myaamia home sites from this period. Headstones of Lafontaine family members in the Fontana Cemetery. From left to right: James O. Lafontaine, Lewis J. Lafontaine, Agnes F. Lafontaine (her stone is lying flat in the center), Louisa Lafontaine, and Unknown (possibly a child who died shortly after birth). All five died young and were the children of Louis Lafontaine and Mary Magdalene Lafontaine (Bourdon). From Fontana, we went across the Missouri border to the location of West Point, Missouri. West Point was the location of the U.S. Military base and trading post that pre-existed our ancestors’ removal to Kansas. 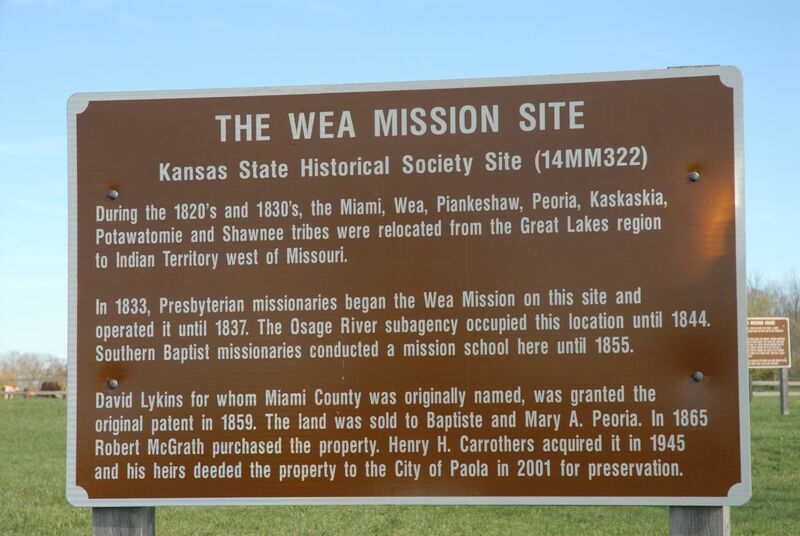 After Myaamia people unloaded at Kanza Landing (today Kansas City, MO), they traveled the military road to just north of where West Point was located. They then cut west to reach what became the Sugar Creek village site. Over the years that followed the 1846 removal, they would have returned to trade at the post at West Point. Tragically, West Point was burned to the ground during the Civil War and the town never fully recovered. From West Point, noohsa and I made the trek back to Paola and toured the town. Baptiste Peoria, the Chief of the Peorias, Weas, and Piankashaws in the mid-1800s, is quite a popular figure in town. There are many landmarks that carry his name and even an impressive bronze plaque in his honor in front of the Miami County Medical Center. 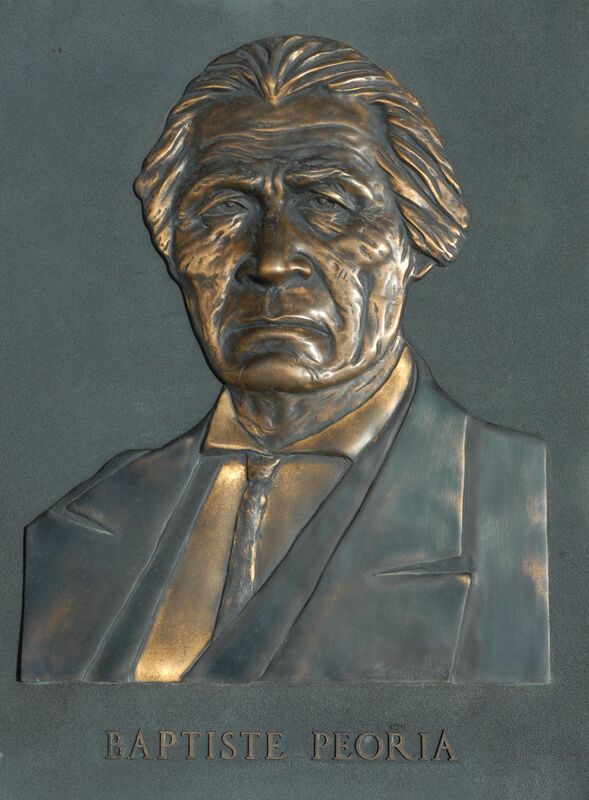 Baptiste Peoria served the Myaamia as an official translator until 1860 and the Wea and Piankashaw peoples who lived in the Paola area in the mid-1800s were originally sub-villages of the Myaamia. Because of these connections we were very interested in seeing the places where they built their homes in the area. Their removal to the west preceded our 1846 removal by a number of years, and I don’t think it was an accident that we became their neighbors when we were forced to move. I am sure that their hard work and sacrifice helped to make Myaamia people’s adjustment to life in Kansas at least a little easier. This relationship of family continues to today, as the Miami Tribe of Oklahoma and the Peoria Tribe of Oklahoma remain family and close neighbors. Sign that attests to the early presence of the Myaamia and our relatives in eastern Kansas. Our visit concluded by sharing a wonderful meal with Lloyd and Jennie Peckman and Slina Prothe and her husband Leland. Slina is a citizen of the Miami Tribe and relative of the McCoy’s. Her husband is related to Vernon Prothe who drove us around his bottomland on the second day of the trip. It was fitting that our trip concluded with a chance to say “mihši-neewe” (big thanks) to Mr. Peckman and with a chance to visit with a Myaamia relative who calls eastern Kansas home. Our three-day tour of Waapankiaakamionki was hardly enough to scratch the surface, in terms of our understanding of our time in Kansas. But with more trips and the help of knowledgeable Myaamia people like Gene Hayward, and knowledgeable and generous local farmers like Lloyd Peckman, we will increase the depth of our knowledge and continue Gene’s work of finding our “Lost Years” and in no small measure, finding ourselves. Today, we use the myaamia word Waapankiaakami (Swan Water) to refer to our original reservation lands in the Marais des Cygnes River. This term was created by Dr. David Costa based on the French place name for the local river: Marais des Cygnes (Marsh of Swans see http://www.fws.gov/maraisdescygnes/). Clarence E. Hayward, The Lost Years: Miami Indians in Kansas, (Kansas City, KS: self published, 2010), 21-22. Bert Anson, The Miami Indians, 1st ed. (Norman: University of Oklahoma Press, 1970), 238. Amy Bergseth, “Our Claims and Rights are Nothing’: Causes of Myaamia (Miami Indian) Removal from Kansas to Oklahoma” (MA Thesis, University of Oklahoma, 2011), 7-8. H. M. McLachlin, The Story of Paola, Kansas 1857-1950, ed. Bernice Boyd Wallace (Paola, Kansas: Miami County Historical Museum), 3, 9-10. Hayward, The Lost Years, 46. Joe H. Evert, “One of the Oldest Land Marks of Miami County,” memoir in the possession of Mr. Norman Minden, Paola, KS. Hayward, The Lost Years, 12. W.O. Atkeson, History of Bates County, (Topeka-Cleveland: Historical Publishing Company, 1918), 265-67.
neewe for taking us along on this historic trip! I learned so much. iihia, I hope at some point in the not too distant future we can all take a series of historic tours in Indiana, Kansas, and Oklahoma. I’m sure some of these folks in Kansas would love to show Myaamia people around the beautiful landscape we all share a history with.